← In A Politely Incorrect Industry, Can You Call A Spade A Spade? 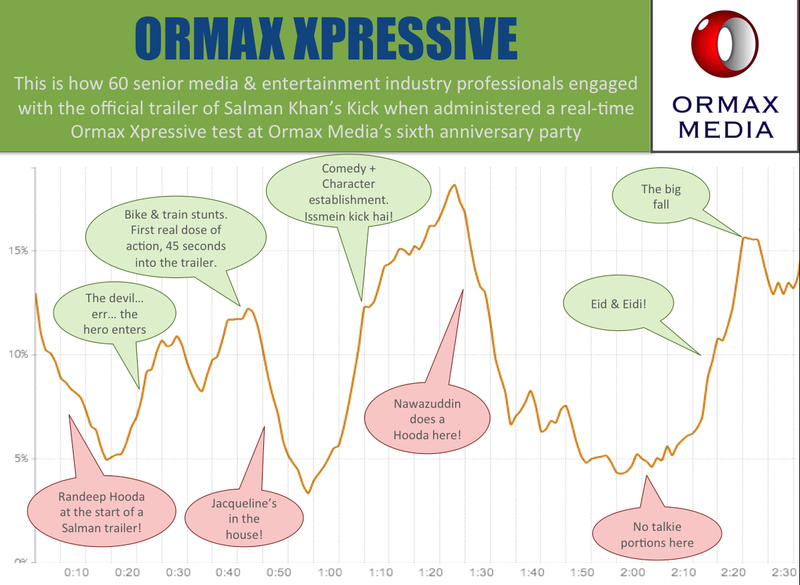 It has been our endeavour to marry technology and consumer insights for the media & entertainment industry in India, and our recent product launch, Ormax Xpressive, powered by RealEyes, is a significant step in this direction. Unlike conventional content research that relies on asking consumers a set of questions (using questionnaires or focus groups), Ormax Xpressive uses automated facial coding technology provided by the Europe-based firm RealEyes, to convert the consumer’s actual behaviour while watching the content, as captured through their facial expressions, into emotions. So, now we can actually know which specific shots in an ad or an episode or a scene triggered which emotions. In the video below, you see how the “Engagement” with the trailer changes second-by-second, as the trailer plays out. Key an eye on the trailer on the left, and the movement in the graph on the right. Engagement is defined as the presence of any of the six basic emotions (happiness, sadness, scare, confusion, surprise, disgust) on the face of the viewer. Watch in HD resolution if your connection permits you to. Many of you have reservations about people saying one thing in research and doing another. Here, what they do is what you see. There is no “saying” involved. For more on Ormax Xpressive, and to download the product deck, visit here. This entry was posted in Films, Product Showcase, Research, Television and tagged Ormax Xpressive, RealEyes. Bookmark the permalink. The solution is innovative and praiseworthy. I have couple of questions though. 1) It’s hard to imagine that one would have similar engagement with repeat viewing. Since the people have would have viewed the trailer before this test, how does the bespoke method factor it or there is no need for it? 2) Generally, a Salman movie is all about playing to galleries. There is certain set formula to it. Mostly people would be either disgusted or happy after watching his work. There is hardly any emotion, intelligence or profoundness in this trailer, so was it ideal for testing such product? So not sure if this trailer provides enough avenues to depict balance 4 emotions. 1. Normally, we would tend to use this product on test audience who are seeing an unreleased ad/ trailer for the first time in the test. Hence, the engagement (or any other emotion) will capture that first reaction. In this test too, we picked people who had not seen the trailer before. Some had seen only a few shots from it, but not the whole thing. 2. You use the word “emotion” differently from how Xpressive uses it. “Emotions” need not be heavy in nature. Even a smile or an appreciation or pure entertainment will trigger the “Happy” emotion, as measured by movement of certain muscles on the face, captured via webcam and then analysed. The product is thus valid for all video content, across genres, including even documentaries or news capsules. Thanks for the clarity Sir.